Had he still been alive - and a darned fine feat that would have been! - Edgar Allan Poe would have celebrated his 201st birthday yesterday. Wow, I hadn't really thought about him being around all that long ago as he's been rather alive at my house what with having his painting hanging on the wall in the dining room just above that of H.P. Lovecraft. How many of you can say that, eh? Ha! Not too darned many I bet! This particular piece of art was created using ink and - believe it or not - coffee! After sketching out Poe, the paper was then painted with a fine layer of coffee and then inked over. Makes for a pretty amazing effect, doesn't it? I swear to God, I don't know where this kid gets her talent as I doubt I could even do one line properly on the man's cravat! In sadder news for our beloved Poe and his fans in Baltimore, it seems that the "Poe Toaster" failed to show up with his customary birthday gifts. Every year since 1949 on the 100th anniversary of Poe's birth (usually at night), a cloaked individual has left a half-bottle of cognac and three roses at the foot of Poe's tomb in the burying grounds next to Westminster Hall in tribute to the legendary poet; but for the first time in 61 years, no one showed up. It's left the Poe Society mystified and baffled - as well as disappointed those who made the pilgrimage to Poe's grave for this year's birthday observance. Upon hearing the news Amanda immediately stated that we needed to go to Baltimore to rectify this injustice but alas - day off or not - driving to Baltimore at the last minute was obviously not on the agenda! Perhaps if we lived closer I might have actually entertained the idea as it's a shame to see a tradition fade away but I'm sure the Toaster had a good reason for not being there. Perhaps he was feeling crummy. You know how toasters get sometimes! but I'm sure the Toaster had a good reason for not being there. Perhaps he was feeling crumby. You know how toasters get sometimes! What Lois said Linda. It could have happened just like that. don't stick a fork in it!!! oh. wait. never mind. What a fun post! Yes, I heard on the news that the mysterious birthday visitor didn't show. There was a very amusing episode of Gilmore Girls where a Poe convention came into town. I'll have to watch that episode later on now that you've got me thinking of it. In honor of this anniversary I shall post the first line of my favorite Poe story. It's unmistakeable who that is. A super picture by Amanda. That gal's got talent! My stick figures are pathetic. I read about the absence of the Poe Toaster. How sad for that tradition to end. Perhaps the Toaster has joined Poe in eternal rest. It is interesting that upon hearing the news story my absolute first thought was, "Oh Amanda won't like that". Amanda's talent never ceases to amaze me! I love the idea of coffee on the paper! Genius!!! So, is the cloaked person the same person every year? Maybe the person passed away and there was no one to replace them? It IS a bit baffling to say the least. I had not heard the news, rather sad isn't it? Amanda's picture is great, you might not be responsible for her talent with drawing, but I think I see a resemblance in creativity. 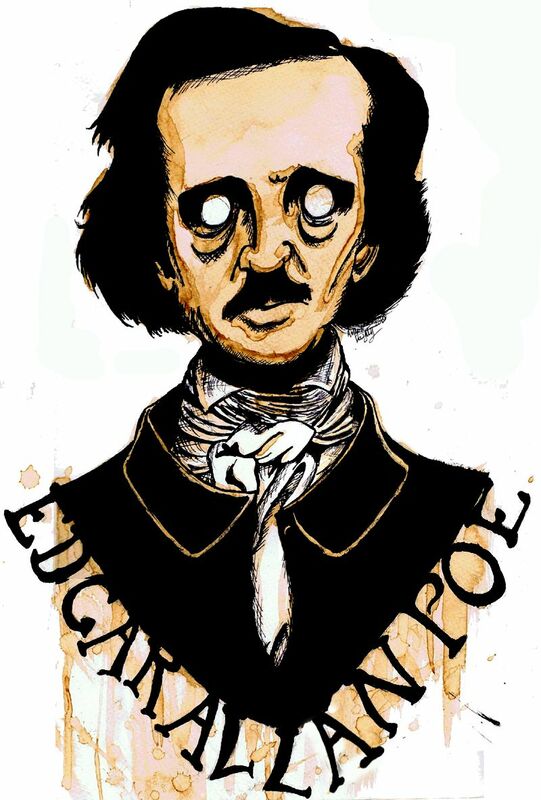 That is an AMAZING rendition of Poe! You and your daughter should be PROUD!